Since 2017, New York based artist and writer John Donohue has been pursuing his — admittedly unlikely — quest to draw all of the restaurants in New York City (estimated to number around 24,000, not counting ongoing closings and openings). He takes this on by sketching on location in pen and ink, without preliminary pencil drawings. He then adds touches of a single color to the drawings. His drawing style is casual and sketch-like, with an almost cartoony feeling at times — unsurprising as Donohue has contributed cartoons to The New Yorker. 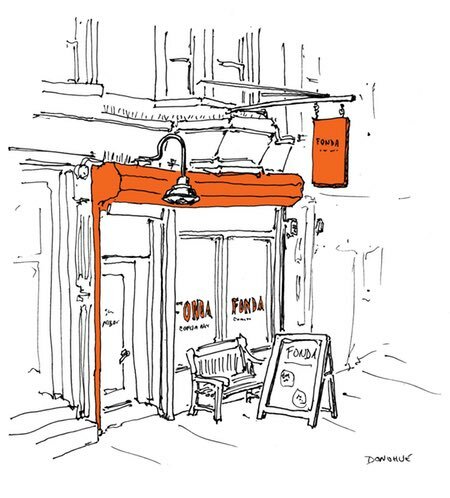 There are plans in the works for three books of drawings of restaurants in New York, London and Paris. In the meanwhile, Donohue has prints available. Love to visit Byblos Lebanese restaurant again one day.